A packed Sewing Room was set ablaze with infectious Cuban passion, Latin-American rhythms and hips-a-swaying on Friday night for The Buena Vista Meets Adam Hall Feat the Cuban Young Guns FRINGE WORLD show, thanks to the six-piece band that included Perth’s own Adam Hall & The Velvet Playboys alongside with The Cuban Young Guns, flown in from Cuba. Trumpeter, Hall, with double bassist, Kate Pass, and percussionist, Bronton Ainsworth, teamed with the Cuban Young Guns (Ernesto Enriquez on tres, Lazaro Ernesto Numa Pompa on trumpet and Pablo Calzado on drums) to set the small stage on fire with their Latin American sass and fiery Cuban repertoire. The show opened with a classic from the Buena Vista Social Club repertoire, Chan Chan. Following the delicate sounds of Enriquez plucking the tres, trumpeter Numa brought the crowd to full attention, entering through The Sewing Room’s dance floor in a blood-red suit and matching red fedora playing trumpet amidst the gobsmacked audience. His surprising entrance set the tone for a captivating and vibrant night as the audience could not help but sway their hips to the pulsating rhythms played by the band. Hailing from Havana in Cuba, award-winning musicians, Numa, Calzado and Enriquez have been performing with well-known Cuban ensemble, the Buena Vista Social Club, formed in 1996, to revive the music of pre-revolutionary Cuba. The Club was immortalised by German director, Wim Wenders, in his documentary, Buena Vista Social Club. 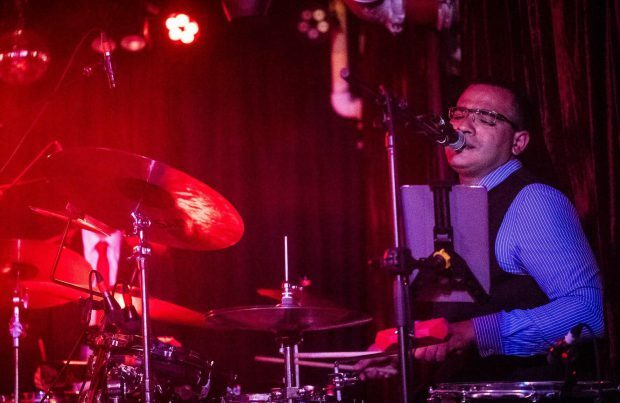 Hall talked about his inspiration for the show that came about through collaborations with the current living members of the Buena Vista Social Club during his time in Cuba last year. While the high calibre profile of the band captivated the audience, those who wanted to dance had a bit of difficulty in the capacity-filled Sewing Room. About a dozen of the audience members brought their dancing shoes and upon commencement of the second Cuban classic, El Cuarto de Tula, stepped up to dance the night away: initially at the front of the dance floor but moved to the back near the bar, so as not to obstruct the view for some in the tightly packed venue. They also moved because the floor was less sticky and easier to dance on. However, those who wanted to dance did not let this stop them from having a great night. The audience lapped up the hour-long set which had a good variety of mostly vibrant Cuban numbers interjected with a few down-tempo songs. 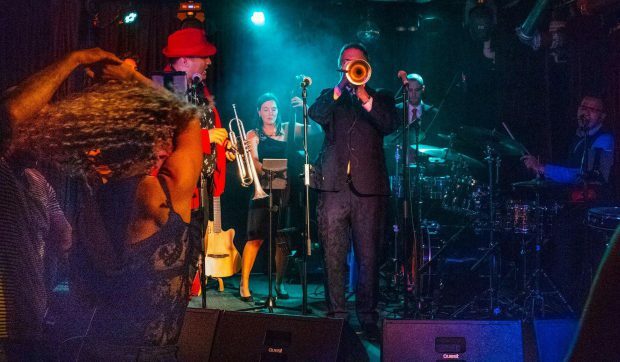 With a mix of classic Cuban and Hall’s English originals thrown in, you may have been left wanting more of the sounds of Cuba if that is where your heart is. 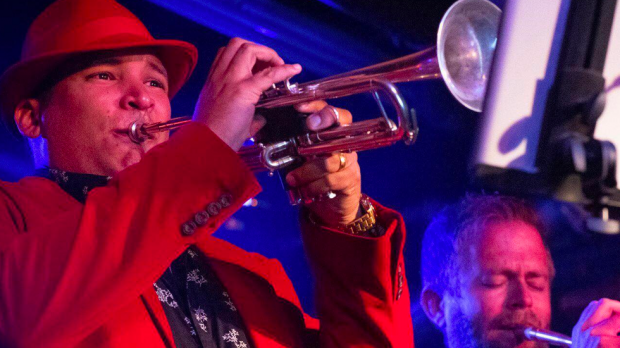 However, the band owned the night with their seasoned and formidable talent, as Adam Hall & The Velvet Playboys together with the members of the Cuban Young Guns gave Perth an authentic taste of the red-blooded sounds of Buena Vista Social Club. It will be interesting to see how the remaining shows of The Buena Vista Meets Adam Hall Feat the Cuban Young Guns will be delivered from February 6 – 9 at The Sewing Room to close out the rest of their FRINGE WORLD season. Given the infectious nature of the music, it will be no surprise if Hall’s remaining shows continue to pack out The Sewing Room and cause hips to sway.